We reopened to the public on February 7 with the two weeks before that being a “soft” launch and it has been a whirlwind! We have served over 20 different groups! The calendar for March is almost full and April is filling quickly! We are so thankful for the widespread support we have felt from across our community. One obstacle we have faced has been sold out shows! People have had to line up for a half hour before the door opens and stand in line, waiting for one of the 59 seats inside. And showing up with your kids for a show on time, only to find out you can’t get in is a pain. It is a great problem to have! We are thrilled to see the excitement. 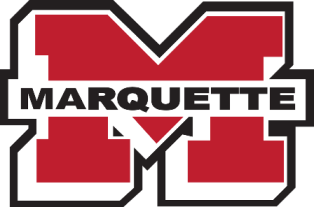 And honestly Marquette- you have not seen anything yet! We have so many new and exciting opportunities planned it will blow your mind! We can’t wait to be able to show you! In an attempt to help ease the stress at the door we have added online ticketing. 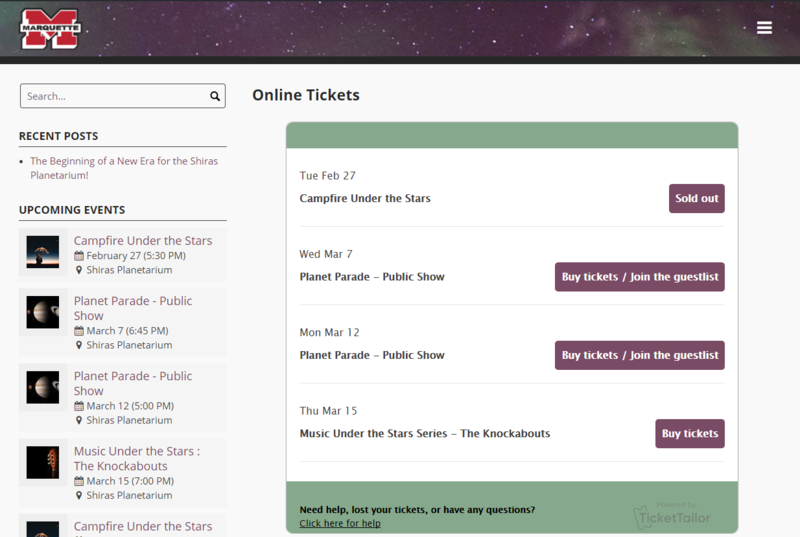 You can visit shirasplanetarium.org/tickets and pay for your ticket online prior to the show. You will also find the link on our Facebook event posts. Once you’ve purchased your ticket online you can arrive 10-15 minutes prior to the start of the show and take your seat. We will have staff on hand to help guide seating. We will require that you move down and fill in rows to leave room for others arriving after you. We are hoping this new option will allow more families to plan their busy lives and include the Shiras Planetarium in the mix! You can view our schedule at shirasplanetarium.org/shows. Welcome to the new Shiras Planetarium website! I am Becky Simmons, the new director and I plan to use posts on this page to keep the public updated on what is happening in our space! We have many new and exciting projects planned, such as a “Music Under the Stars” series, yoga under the stars, planetarium shows on all different days of the week at many different times, and so much more! It is exciting to kick off a new era in an establishment that has been a part of the greater Marquette community for over 53 years! The Shiras Planetarium has a bright future but is faced with many challenges. Our fulldome projection system stopped working in December of 2016 and we have been fundraising for a replacement ever since. Our chairs are original from 1965 and we recently had to remove some recently just to fix others. Our lighting system is aging and has fluctuations and glitches we cannot control. Our Minolta MS-8 star projector was recently maintained and is in good working condition, but is 26 years old and has a projected lifespan of 30 years. A new full dome projection system is between $350,000 and $500,000 for a high quality cove mounted system. New lighting and chairs will cost all of $50,000. And looking forward, we will need over $400,000 in the next five years to replace our star projector if and when it fails. The financial obstacles are huge for a planetarium in a public school. We need strong community partners to keep this gem in the community and thriving for years to come. Phase one of our plan was the addition of an ADA accessible entrance to the planetarium which was completed in December 2017. This makes it so much easier for all people to visit our space. We also gained a beautiful new neighbor, the MSHS Auxiliary gym. The last group of kindergarteners in the planetarium ended their visit with a quick game of chase the director around the gym before getting back on their bus! 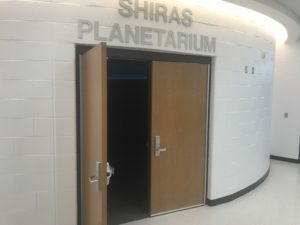 Having this space next to the planetarium and easy to get to opens the doors to many new types of activities the Shiras Planetarium and Marquette Senior High School can offer the community. Phase two of our upgrades includes new seating, a full dome projection system, and new LED RGBW lighting. We will also install new carpet, fresh paint, and a few minor remodeling touches. MAPS is committed to partially funding the project. But our financial needs are over $500,000. That is out of the budget. We will need financial partners and donors to pull it off. In upcoming posts I will talk about all the new events we will be able to do with this new technology and furniture and how we plan to increase our offerings to the public! Hope to see you under the stars soon! Check out our schedule for show details!